April Slaughter, in collaboration with ‘Alien Dave’ Rosenfeld & The Utah UFO Hunters, has created an open paranormal discussion forum. OFFPLANET is a board where all things paranormal are discussed and examined. Please feel free to sign up and share your views with us! We look forward to seeing you there. 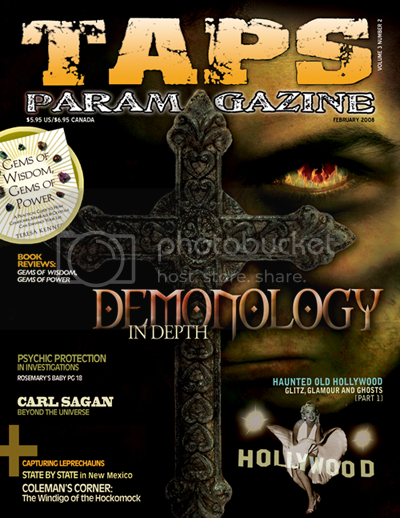 April Slaughter had the opportunity to sit down with our Advisory Director of Demonology John Zaffis for an in-depth interview on the subject for a series of articles to be published in TAPS Paramagazine. The first of these articles will be issued in the latest edition of the publication. For more information on subscribing to the magazine, click the image below. April’s focus was to shed light on the current interest in Demonology, and her interviews with John will divide fact from fiction. They discuss the personal and professional impact his involvement in possession cases has had, his views on how to handle a number of different situations, and advice for those seeking help with difficult paranormal situations. The Board of Directors has extended our Advisory Board with two new members. Adam Blai has accepted the role of Advisory Director of Demonology & Psychology. Chad Calek has accepted the role of Advisory Director of Field Investigations. Both of these individuals bring a great deal of knowledge and experience to the Paranormal Source, Inc. Team and we are honored to be working with them. Our Advisory Board is an impressive collective of experienced and professional individuals whom we are very proud to have on the team. We thank all of them for their continued support and contributions. You are currently browsing the Paranormal Source - Paranormal Research & Development Team blog archives for March, 2008.